Do you cringe when a talking head pronounces “niche” as NITCH? Do you get bent out of shape when your teenager begins a sentence with “and,” or says “octopuses” instead of “octopi”? Do you think British spellings are more “civilised” than the American versions? Would you bet the bank that “jeep” got its start as a military term and “SOS” as an abbreviation for “Save Our Ship”? If you answered yes to any of those questions, you’re myth-informed. Go stand in the corner—and read this book! 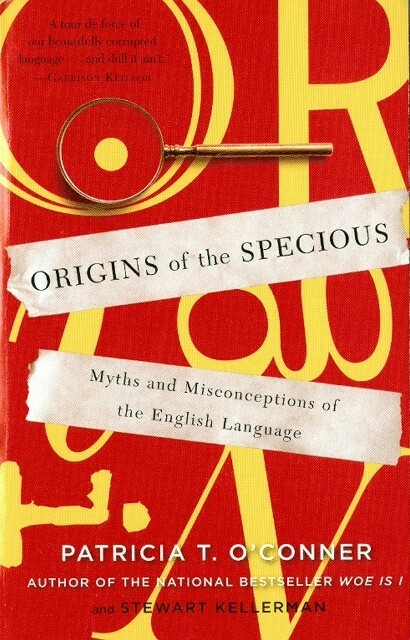 In Origins of the Specious, word mavens Patricia T. O’Conner and Stewart Kellerman explode the myths and misconceptions that have led generations of language lovers astray. They reveal why some of grammar’s best-known “rules” aren’t—and never were—rules at all. They explain how Brits and Yanks wound up speaking the same language so differently, and why British English isn’t necessarily purer. This playfully witty yet rigorously researched book shoots down myth after myth, setting the record straight about bogus word origins, politically correct fictions, phony français, fake acronyms, and more. English is an endlessly entertaining, ever-changing language, and yesterday’s blooper could be tomorrow’s bon mot—or vice versa! The authors take us wherever myths lurk, from the Queen’s English to street slang, from Miss Grundy’s admonitions to four-letter unmentionables. This eye-opening romp will be the toast of grammarphiles and the salvation of grammarphobes. Take our word for it. To buy Origins of the Specious, visit your local bookstore, Amazon.com, or Barnes&Noble.com. Stiff Upper Lips: Why Can’t the British Be More Like Us? In many ways, American English is more like the original than the variety now spoken in the UK. Americans have preserved much of the old mother tongue that the Brits have lost—yes, even the original accent! Grammar Moses: Forget These Commandments. It’s never been wrong to “split” an infinitive, to end a sentence with a preposition, to use contractions, or to say “go slow.” If there’s a lesson to be learned here, it’s this: Any so-called rule that makes you sound like a twit probably isn’t legit. Bad Boys of English: And Why We Still Love ’Em. Believe it or not, “ain’t” has a long—and not so disgraceful—history. So does “axe,” which used to be the standard way to spell “ask.” And George W. Bush wasn’t the only president to say “nucular”—not by a long shot. Lex Education: Cleaning Up Dirty Words. Some of the silliest myths about English are the result of our attempts to clean up four-letter words. No, none of those unmentionables are innocent bystanders, parading around as acronyms or ancient holy words. Learn why many Saxon terms are forbidden while the Latin versions are acceptable in polite society. An Oeuf Is an Oeuf: Fractured French. A French author’s pen name isn’t a nom de plume, a French woman doesn’t call her nightgown a negligee (or her bra a brassière), and a French audience doesn’t shout “Encore!” to hear Sam play it again. By the way, “niche” has long been pronounced NITCH. Sense and Sensitivity: PC Fact and Fiction. The word “woman” isn’t derived from “man,” and there’s no “his” in “history.” The expression “call a spade a spade” isn’t racist, and “shyster” didn’t come from Shylock. Prepare to change your mind about where words come from and where they’re going. English is being reinvented every day all over the world. It’s never finished, and that’s its greatest strength. But amid all this change, myths are born. Let’s puncture a few! “According to how you look at it, O’Con­ner has turned on her fellow preservationists (‘fuddy-duddies,’ is it? ), or she has evolved along with the language. In Woe Is I, she took a hard line on the difference between disinterested and uninterested. Now she says the one, generally speaking, means the other, because ‘as we all know, in English the majority rules. All those usage experts will eventually come around. . . . You can take a stand, use disinterested to mean not interested, and risk being thought an illiterate nincompoop by those who don’t know any better.’ You’ll note that ‘those who don’t know any better,’ here, are the ‘usage experts.’ That is a bit much, coming from someone who is widely regarded as a usage expert. O’Conner goes on, however, to offer characteristically good advice, which is to finesse the issue (that is, to avoid confusion) by using impartial instead of disinterested and not interested instead of uninterested. “Patricia O’Conner and Stewart Kellerman know how to have fun with the English language. ‘Origins of the Specious’ offers readers two-hundred-plus pages of permission to speak freely. That’s because, well, everything you know is wrong and the rules are generally being enforced by those who don’t know them….